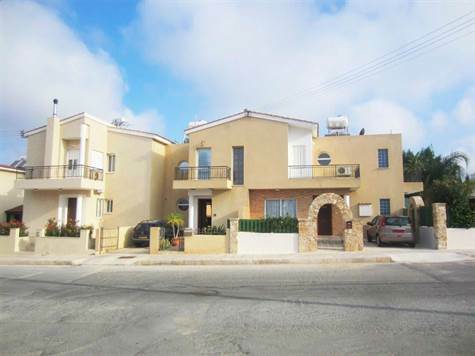 Emba, Paphos, Cyprus - This individual townhouse is the middle one of only three architect designed homes, each carefully arranged and planned to offer privacy and spacious & comfortable accommodation. There is a useful ground floor WC and a feature turning granite staircase with custom stainless steel balustrade leading to the first floor with 3 bedrooms; the master Bedroom has an en-suite toilet and wash basin, large built in wardrobes, feature raised sloping ceiling and patio doors to the rear balcony, overlooking the pool with sea & mountain glimpses. The second bedroom is a comfortable double with circular window to the front and patio door to the balcony. The third bedroom is a smaller room, designed as an office / study where the work space is the actual size for a single mattress. There is a small balcony to the front of the property. Each bedroom and the living area have split unit air conditioning together with remote control ceiling fan lights. Situated in the Petridia area of Emba, this property stands in a quiet residential road near the Gymnasium of Emba – there are 2 kiosks and a tavern just around the corner / within easy walking distance and you are just minutes by car from Paphos Town Centre (3 km), the Sea, Limassol Highway, or any shops, facilities, schools & supermarkets. The property has the AX number and finalization certificate of approval and completion.